Yellow Jacket sightings are increasing in the Lake Tahoe region. Like spiders and snakes, yellow jackets are amazing creatures often best left alone and out of harm's way. 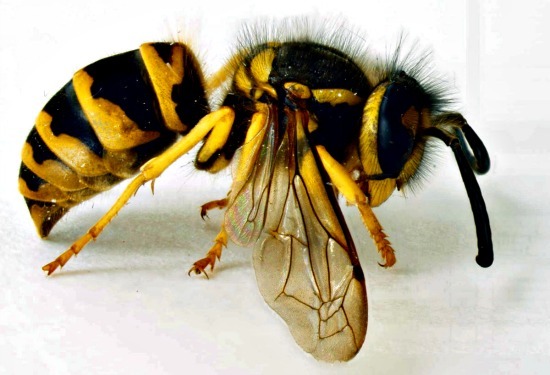 Extra precaution is recommended for yellow jackets in the Lake Tahoe area since health officials have reported increased problems with the pesky members of the wasp family. According to the Associated Press, the El Dorado County Department of Environmental Health has averaged about 10 calls per day for the last week with regard to yellow jackets. Karen Bender, the department's spokesperson, said a mild winter allowed more of the queens to survive into the spring and build the nests that can house as many as 5,000 worker yellow jackets in the summer and fall. El Dorado County residents pay a $6 fee for vector control as part of their property taxes, so Bender recommends they take advantage of the extermination service provided by environmental health specialists who apply a pesticide that comes in a white powder and is not sold to the public. "One reason we want vector control to go out is because we don't want to kill honeybees," Bender told the Lake Tahoe News. She said honeybees are the "good" bees needed to pollinate plants. Yellow jackets make nests in the ground, under decks, in walls, under eaves and in trees. Wasp stings, according to medical experts, can cause varied reactions — minor irritation to serious allergic reactions. Lake Tahoe area medical facilities have reported an increase wasp sting cases, but that last year's total has not yet been surpassed.